Stressed about the expense to buy Oki C711n toner cartridges these days? Fortunately, right here Cartridge Save, you'll pay considerably less for toner than anywhere else. It's time to leave behind paying expensive high-street prices because we'll give you a less costly option. Settling for a poor quality Oki C711n toner isn't beneficial to you or your Oki laser printer. Because of our no quibble cash back guarantee on toner cartridges you don't need to take any risks. We'll give you a full refund in the unlikely event that your Oki C711n cartridge fails to meet perform as you'd expect it to. Place your today at Cartridge Save to save money. This powerful but compact workhorse delivers professional-class speed and performance for small workgroups that need a versatile colour laser printer. 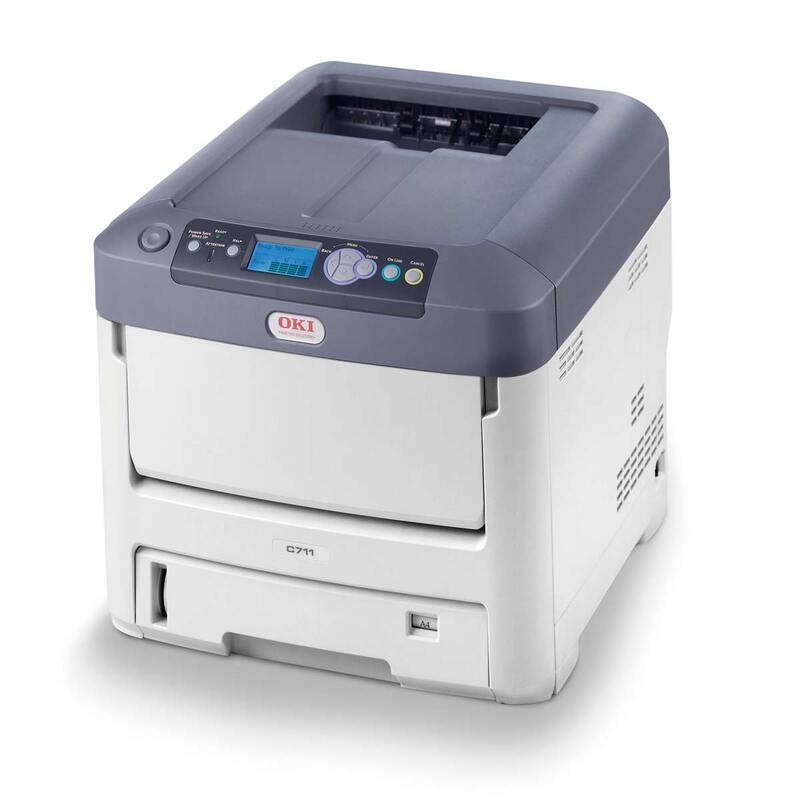 The Oki C711n colour LED printer boasts advanced networking options and fast print speeds, but the print quality is not that impressive and some essential features to increase workplace productivity are absent from the Oki C711n's make up. The LED-based, laser-class Oki C711N printer is notable for its industrial box-type frame that includes a simple control panel, a 100-sheet multi-purpose tray, and a standard 530-sheet main tray in front. The Oki C711n printer measures 17.1 inches deep, 21.5 inches wide, and 15.3 inches tall, and weighs quite heavy at 27.21kg. The C711n offers Ethernet, parallel, and USB connectivity. This printer is good for bulk printing and costs per page are kept to a minimum because of high-capacity toner cartridges. The Oki C-711n is true to the company's claims in terms of speed, at up to 34ppm in colour and monochrome. It can accommodate paper sizes as big as A4 and a variety of media ranging from envelopes to transparencies and iron-on transfers. The Oki C711n colour laser printer is also a smart choice for graphics and photo printing because of the rich and amply-saturated colours. The duty cycle of the C711N printer is up to 100,000 pages per month, so it is good for big volume printouts. The Oki C-711n may disappoint in terms of text quality that showed obvious banding and dithering. The printer could be better if it had an additional USB port in front so users can directly print from a flash drive and use the C711n A4 colour printer as a standalone device to save time. The high initial cost of the Oki C711n is another setback because users can find cheaper laser-class colour printers from other brands.